I agree to insure my vehicle(s) & property against loss, damage & liability I agree to assume the risk of any & all damages or injury to my vehicle(s) & to indemnify & hold harmless to officers, directors or agents of the Alberta All British Motoring Association for any acts of omission, which may result in the theft, damage or destruction of property or injury to me and/ or others, occurring as a consequence of my participation in the 2019 Alberta All British Motoring Association. I agree to display my vehicle(s) in Victoria Park, parked in gear & with the handbrake on until the conclusion of the show at 4:00 pm. 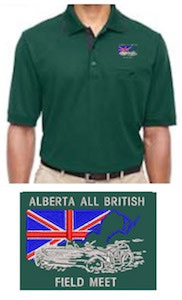 By entering my vehicle(s) in the 2019 Alberta All British Motoring Association I agree to this release of liability.